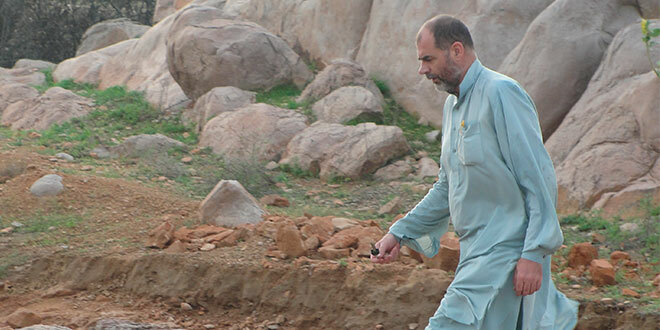 MISSIONARY priest Fr Tomas King has spent the past 25 years in Pakistan, witnessing the ravages of war, discrimination and man-made drought, yet he maintains a steadfast passion for the people he serves. “I have presided at as many funerals for children than for adults,” Fr King said. “You see a lot of pain because of the suffering of the people, and that can be hard. Fr King, 54, came to Pakistan, from the lush green hills of Galway, first during his formation, and then as a newly ordained Missionary Society of St Columban priest in 1992. He still has his strong Irish lilt, and a pastoral heart for the downtrodden. In Ireland he had worked with the persecuted Travellers, an ethnic people commonly known as gypsies in Europe and elsewhere, who are often ill-treated and resigned to the lowest socio-economic class. Today, he finds himself serving the poor in Sindh province, including the vast Tharparkar desert, in Pakistan’s south-east, bordering with India. It is a place of beauty, especially after the monsoon rains, but when the rain doesn’t come, crops fail, there is not enough drinking water and the desert becomes a place of suffering for tribal people like the Parkari Kohlis. Fr King has witnessed the impact of global warming on everyday life. “Unfortunately, for the last ten years there have been drought conditions,” he said. A heatwave in the summer of 2015 killed thousands of people, mostly children. Thousands of livestock – vital to the economy of the desert people – also died. “The impact is that people migrate to become labourers in the interior Sindh where they can find work, food and water,” Fr King said. Usually about twice a month, Fr King drives across the desert between the 15 villages that make up the Parkari Kohlis homeland, celebrating Mass and delivering support for the small but vibrant Catholic community, administrated by Columbans since the mid-1980s. There are less than 100 Catholic families scattered over a vast geographical area half the size of his native Ireland. The Columbans in Pakistan, including five ordained priests and three sisters, concentrate their efforts on providing schooling, and mother-and-child outreach clinics for the poor, not just Christians. 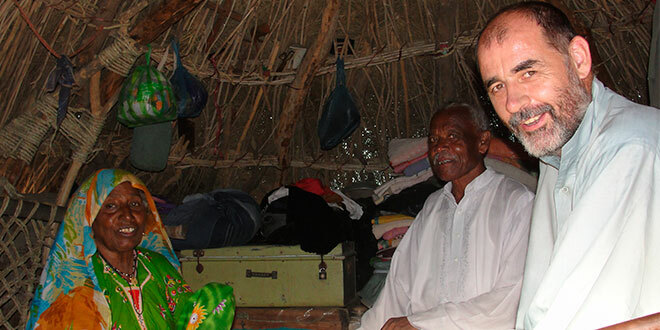 Like a local: Fr Tomas King has spent 25 years in Pakistan. In Pakistan, Muslims make up 96 per cent of the population, with the remaining four per cent made up of mainly Christians and Hindus. In Sindh province, close to India, there are a higher proportion of minorities, including Christians and Hindus. Fr King found his work amongst low-caste workers and their families – farm labourers, brick kiln workers and street sweepers. “In the town of Badin we have a high school of around four hundred children – thirty-five per cent would be Christian, thirty per cent Muslim and the rest would be Hindu, and the staff would be made up of different denominations,” he said. Fr King has quietly become an advocate for interfaith dialogue, trying to build relationships of trust and respect that seldom exists among the religions. His parish work and catechesis focus on human rights awareness and promoting better healthcare and education. He is fluent in Urdu, the official language of Pakistan, and was appointed co-ordinator of the Columbans’ Pakistan Mission Unit in March 2008. “We see the importance in today’s world of working with people of goodwill from all faiths to make a better world, because it’s the only world we have,” Fr King said. “The big human rights issue in Sindh is bonded labour … rehabilitating people who have broken out of bonded work on the land of landlords. Fr King said the writings and teachings of Pope Francis had affirmed the Columbans’ work in Pakistan over many years – “especially making the Gospel present in the rituals, the flavour and the culture of the people”. “Laudato Si’ has a strong emphasis on interfaith dialogue, so we feel strong support from that,” he said. Fr King said that, in the Tharparkar desert, major, new environmental and economic challenges were taking shape. Underneath the desert sands massive amounts of coal have been found – one of the largest untapped coal sources in the world. It’s a significant discovery since Pakistan produces insufficient power to provide electricity for all its people’s needs. Electricity cuts, often for hours on end, are a part of daily life, particularly during the hot summer months when there’s high demand, particularly from running air conditioners. In such a context, coal in the Tharparkar desert has the potential to end load-shedding and provide for Pakistan’s energy needs for generations to come. The Pakistan Government and some mining companies, including a Chinese company, have already started coal extraction, as well as upgrading roads and infrastructure to support a massive mining expansion. Fr King said China’s presence, part of a grander “One Belt, One Road” economic expansion, reinforced its policy of seeking out natural resources from anywhere in the world to feed its own domestic needs. “The direct impact has still not been seen. What will be the cost to the desert environment, its people today, and to future generations?” he said. Despite the struggles and the challenges ahead, Fr King said there was a beauty about Pakistan and its people. “It can be difficult but it holds you,” he said, recalling the 1989 Irish movie My Left Foot, which is a tribute to the overwhelming sense of the miraculousness of life. Personal encounters: Fr Tomas King on visitation in Pakistan.